Spring is approaching and the desire to travel and discover unusual lands is growing: it’s the perfect opportunity to visit the Svizzera Pesciatina. It is a territory with very ancient landscapes, which owes its name to the Swiss intellectual Jean Charles Léonard Simonde de Sismondi, who after settling in Pescia in the early nineteenth century saw in the beauty of these places all the pleasant poetry of the Swiss valleys. Svizzera Pesciatina, also called Valleriana, is a territory full of hills embellished by ten pearls: the towns of Pontito, Stiappa, Castelvecchio, San Quirico, Vellano, Sorana, Aramo, Fibbialla, Medicina and Pietrabuona. These are also known as “dieci castella” (ten castles) because each hamlet hosts a castle. Like any usual canton, Svizzera Pesciatina also has its county town, Vellano. 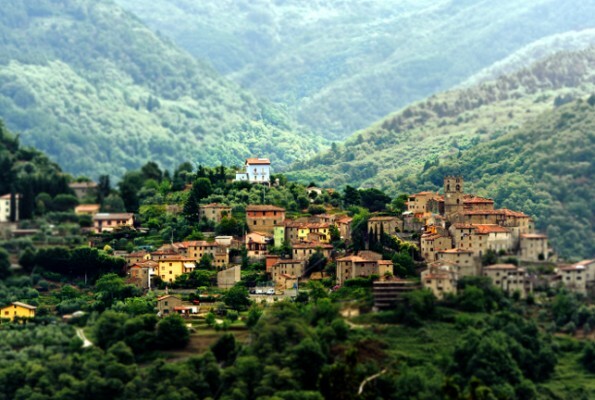 Probably of Ligurian origins, it is today a tourist resort that attracts thousands of visitors every year. It is a historic village full of ancient beauty, and it has been a very important manufacturing center for Pietra serena and “corbelli”, that is to say, baskets and hampers. Fun fact: vellanese citizens do not use the word “streets”; for them, the streets are “rughe” (wrinkles) that tread the country and separate the houses. This small and enchanted corner is dominated by Pontito, a fan-shaped town 750 meters above sea level completely made in stone, a haven adored by the famous Oliver Sacks. Every stone in this country is engraved, even the ones on the streets. Stiappa is something unique: a village built on the border between two perpetually struggling duchies; instead of defensive walls, the town built its barriers thanks to the houses, arranged over time to surround the castle. San Quirico is known for its small houses, stone arches and the hexagonal watchtower. In March, there is the famous “Sagra dei necci”, a kind of crepe prepared with chestnut flour matured during the winter months. Known to every foodie for its extraordinary beans, the village of Sorana boast a thousand-year long history and spectacular fourteenth-century walls. In Aramo you can stumble into the tunnels that the population dug to save themselves during the conflicts between Lucca and Florence. Centuries ago, there was a full system of underground streets, which today is only partially visible. Pietrabuona was a center of excellence for paper manufacturing and today houses a museum dedicated to paper. The old paper mill buildings are still visible today, with the old machines that were already active when paper was made from rags. From Medicina you can enjoy a unique panorama, between Val di Forfora and Val di Torbora. The strategic position inspired the people of Lucca, whom in 1431 established in Medicina the base-shelter of the French adventurer Francesco de la Motte and gave him the task of carrying out raids in the Valdinievole, dominated by the Florentines. The parish church houses a diary illustrating the events of the town from 1 August 1529 to the middle of the last century.